As a famous Islamic snack, mutton (or beef) soup with pancake pieces is delicious and mellow, with a tempting smell. At the banquet, a wide variety of Jiaozi dumplings in different shapes and with different stuffing are served, fresh. delicious and nutritious. As early as in the Qing Dynasty, Qishan's saozi noodles of Shaanxi Province were famous for a spicy, sour and delicious taste, thin noodles and a good smell. Such noodles are prepared with high-quality flour, pork, eggs, day lilies and edible funguses, in addition to a wide variety of seasonings. In ancient times, Qianxian County in Shaanxi Province was called Qianzhou. 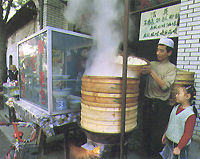 As a popular local snack, Qianzhou hard wheat cake is as large as a lid of a cooking pot, thin on the edges and thick at the center. Hard, crisp and tasty, this wheat cake can be stored for quite a long time. As a famous snack of Van, Fan's pancake with stewed meat was first created by Fan Bingren and his son Fan Fengxiang, with a history of nearly 80 years. Prepared with highquality meat, Lazhi meat is well stewed with broth of the preceding years.